Much of the population still subsists on less than the equivalent of USS1 a day, the provision of even basic services remains inconsistent, and political intrigue remains as complex and opaque as ever; but the security situation has improved immeasurably, and increasing numbers of visitors are rediscovering Cambodia’s temples and beaches. A tropical country, Cambodia is warm all year round, though there are several distinct seasons. There is little rain between November and May, the so-called dry season, which itself divides into two distinct phases. The cool season (Nov – Feb) is the peak time for tourism, as it’s cool enough to explore the temples in comfort and yet warm enough to sunbathe by the coast. The hot season (typically March – May) is when humidity and temperatures soar, with Phnom Penh and Battambang seeing peak daytime temperatures of 33 – 35dg C. At this time, it’s best to rise early to get out and about, returning for a snooze at midday and emerging again late in the afternoon. The rainy season lasts roughly from June to October. River levels rise dramatically, and in September and October the country’s infrastructure is at its most stretched, with dirt roads, reduced to deep slurry and a risk of flooding in provincial areas. The main destinations where suitable Accommodation’can be found are as follows. Battambang 51 hotels interesting assortments includes guesthouses villas and hotel Accommodation. Kampot 30 hotels lodges guesthouses coastal area. 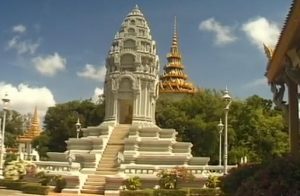 Top 10 Tourist Attraction in Cambodia. Explore the temples of Angkor, Cambodia with Google Maps. In the above video uncover the tangled trees and towering temples of Angkor with Google Maps. Explore Angkor Wat and other Cambodian temples. There are many temples around for you to see (as mentioined above). Make sure to have your shoulders and knees covered when entering the temples to give respect to local traditions: Explore the Cardamom mountains for jungle trekking and waterfalls. Walk S.E. Asia’s largest mangrove forest. 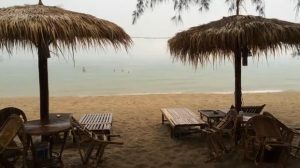 Hang out on white sand beaches, all in Koh Kong. Laze on the beach in Sihanoukville; Enjoy the river and peace in Kampot or visit the temples of Angkor near Siem Reap. Lonely Planet Cambodia is your passport to all the most relevant and up-to-date advice on what to see, what to skip, and what hidden discoveries await you. Explore the magnificent temples of Angkor, experience the best and worst of Cambodian history at the capital, or taste the subtle spices of Khmer cuisine; all with your trusted travel companion. 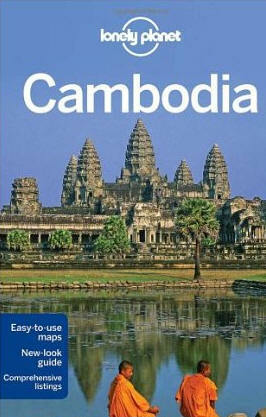 Get to the heart of Cambodia and begin your journey now! On the other hand, once you are there several publications are freely available in the hotels, restaurants or bars. All tourist guide books include information, maps and advertising about a certain area. When shopping be sure to look for businesses that display the Heritage Friendly Business Logo. Heritage Watch has launched a campaign that aims to encourage support for Cambodia’s arts, culture, heritage and development. You can get away with pretty much haggling for anything in Cambodia. Restaurants, outdoor food stalls, even rates for guesthouses: many products, especially those not aimed at tourists, are fixed price, and while it is possible to get a minor discount if you ask you cannot get things significantly cheaper than this. Many markets have the prices of goods painted on the walls in Cambodian. 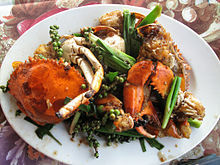 Khmer cuisine or, more generally, Cambodian cuisine, is the traditional cuisine of Cambodia. Average meals typically consists of more than one dish and ideally contrasts flavours, textures and temperatures within the meal using plenty of herbs, leaves, pickled vegetables, dipping sauces, edible flowers and other garnishes and condiments. Breakfast at Skun in Kampong Cham Province of Cambodia. We travel to Kampong Cham Province on Sunday morning for Kathen Ceremony there. We stopped for breakfast at Skun at a very busy restaurant with lots of people ordering foods for their breakfast. They have fried pork with rice, fried chicken with rice, Cambodian Noodle soup, Hot noodle soup with pork chopped, coffee with milk and ice tea. It’s a very busy restaurant where people like to stop for breakfast as they can enjoy the street foods and fruits there as well. Street food is ready-to-eat food or drink sold by a hawker, or vendor, in a street or other public place, such as at a market or fair. It is often sold from a portable food booth, food cart, or food truck and meant for immediate consumption. Some street foods are regional, but many have spread beyond their region of origin. Most street foods are classed as both finger food and fast food, and are cheaper on average than restaurant meals. According to a 2007 study from the Food and Agriculture Organization, 2.5 billion people eat street food every day. Also Bed Breakfast Bed and Breakfast B&B BB or BnB details for your next vacation Regional Cuisines information guide. B and B is an English traditional holiday idea, often hard to find in some parts of the world. Take A Break Holidays takeabreakholiday, Cambodia Accommodation.